Read on to learn more about how you can try conserving water on your lawn. The trends have moved toward conservation and green living, some even going as far at to try to produce no waste at all. Many homeowners with lawns are trying to find ways to keep their own lawns green and healthy while conserving water and respectfully existing in their environment. Read on to learn more about you can try conserving water on your lawn. Below are some helpful lawn care tips. Feed your lawn something like lawn food 2-4 times a year to keep it green and happy. Regular feeding massively improves your lawn’s appearance because it makes sure it has the nutrients it needs to thrive. It also helps a lawn crowd out weeds and stand up to wear and tear. Many people think all you need to do for a lawn is pour water on it, which is not true at all. 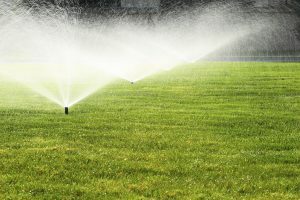 This can ultimately be quite wasteful and expensive if a homeowner keeps pouring water into a dying lawn and will not help you when it comes to conserving water on your lawn. After you cut grass, leaving the grass clippings is a great way to return beneficial nutrients to the soil. It’s free, easy, and will be very beneficial for your lawn. Be sure to never cut your lawn too short for the type of grass it is, which can potentially damage it. This is key when it comes to conserving water on your lawn. Depending on your climate, Mother Nature often provides more than enough water for a lawn to grow healthy and strong, meaning that you will not have to water at all. If you choose to water, wait until your lawn is a dull green color. Also, some lawns in some areas even go dormant for a month or two, turning brown. This is perfectly natural and your lawn will pop up back again in a few months. For the past ten years, Edwards Lawn and Home has been offering premier residential and services to improve your property all year long. The options are endless from a new patio to a backyard fire pit, let the winners of Angie’s List Super Service Aware serve you! If you’re interested in finding out more about our services or getting a quote, you can contact us online or give us a call at 443-341-6539. For more information about our services or DIY tips and tricks follow us on Facebook, Twitter, Google+, LinkedIn, YouTube and Houzz. This entry was posted on Thursday, April 27th, 2017 at 1:38 pm. Both comments and pings are currently closed.